Donald Tusk, the President of the EU Council, has lashed out at the UK, saying he wonders what the “special place in hell” looks like for those who pushed for Brexit without coming up with a clear plan to deliver it. Addressing reporters in Brussels, Tusk reiterated the EU’s position on the Withdrawal Agreement, stating that the Brexit deal agreed with Theresa May’s Tory government in November last year, was not open to renegotiation. May arrives for talks with EU officials on Thursday in an attempt to formulate “alternative arrangements” on the contentious Irish backstop. Tusk declared that he hoped the UK PM would come to the negotiating table with some realistic suggestions on the backstop. 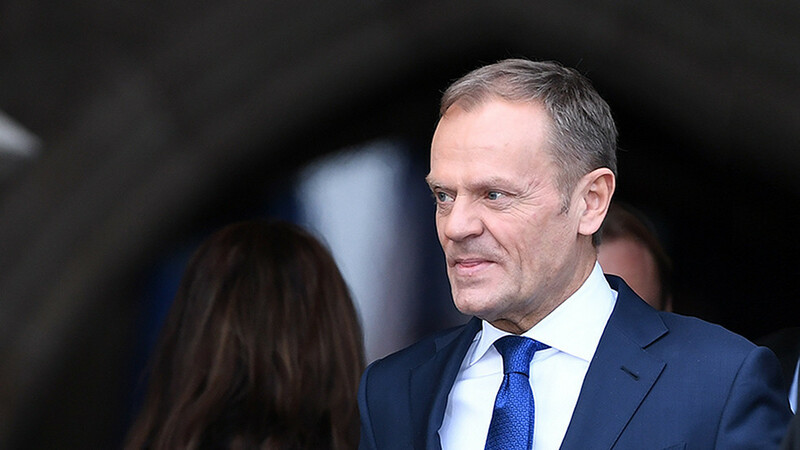 On the prospect of a ‘no-deal’ scenario, Tusk insisted that Brussels is preparing for such a “fiasco,” before delivering some harsh words for UK government officials. “I have been wondering what the special place in hell looks like for those who promoted Brexit without even a sketch of a plan to deliver it safely,” he said. The EU Council president, flanked by Irish prime minister Leo Varadkar during his statement, claimed that people across Europe were hoping the UK would reverse its decision to leave the European Union. May is today holding Brexit talks with the five main political parties at Stormont in Northern Ireland, in a bid to reassure them that she can secure a deal that avoids a hard border, before heading on to Brussels for crunch talks with the EU. R ~ How dare this flunky. Tusk was a rather dodgy politician back in his days in Poland, and he's just seemed to get more arrogant since he's been a senior EU bureaucrat. The problem with Brexit is that it wasn't supposed to happen. The idea seems to have been that Cameron (the then UK prime minister) called a Referendum as a cosmetic device to enable him to override dissidence within his ruling coaltion of Conservatives and Liberal Democrats by being able to hold up the result as showing that "the British people" were overwhelmingly behind 'more Europe'. Unfortunately for him and his cohorts, 17.4 million Britons voted to Leave - the largest single democratic result ever in British politics. So Cameron resigned. Theresa May (Cameron's replacement) seems to have been dragging her feet and making leaving the EU as difficult and agonising as possible. Two years (the required interval after delivering the Article 50 ultimatum) would be quite long enough to arrange all the necessary deals. The "No Deal" option actually simply means that the UK will trade with the 27 countries of the European Union using the World Trade Organisation (formerly known as GATT) rules that it uses to trade with the rest of the world. In fact, the UK doesn't actually do much business with most of those 27 - most UK European Trade is with France and Germany, and real business leaders (such as German car manufacturers, and French wine makers) have indicated that they'll be quite happy to trade with the UK on WTO terms. It also seems that the British civil service has been beavering away quietly to set up the various mechansisms necessary. The problems in Ireland are mostly smoke and mirrors, as there has been a soft border between the UK and the Republic since 1922 and there's no reason for that to change. Tusk is simply stirring, just like his colleagues Verhofstadt and Barnier. It is becoming obvious that the battle is coming down to atheists/satanists determined to elevate the hierarchy of men above the hierarchy of God. What better way to dismiss the deplorables as being of no consequence. We are all destined for hell if we don't obey those that control the minions such as May, Tusk, Merkel, Macron and others of their ilk. They are in full ad hominem mode to obfuscate their agenda of bringing man into man-made technological heaven greater than what God created. Page created in 22.068 seconds with 20 queries.